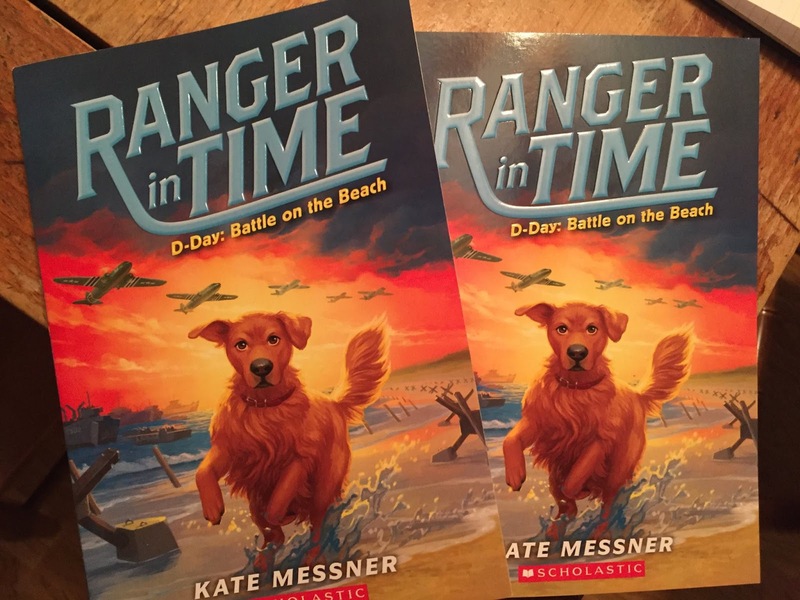 It's hard to believe that we're on the 7th book in the Ranger in Time series! 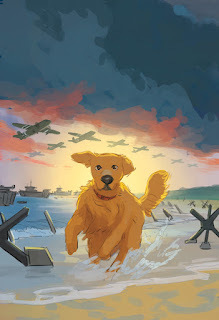 For this cover, the team at Scholastic asked me to draw Ranger on the beach at Normandy. (Yes, really!) 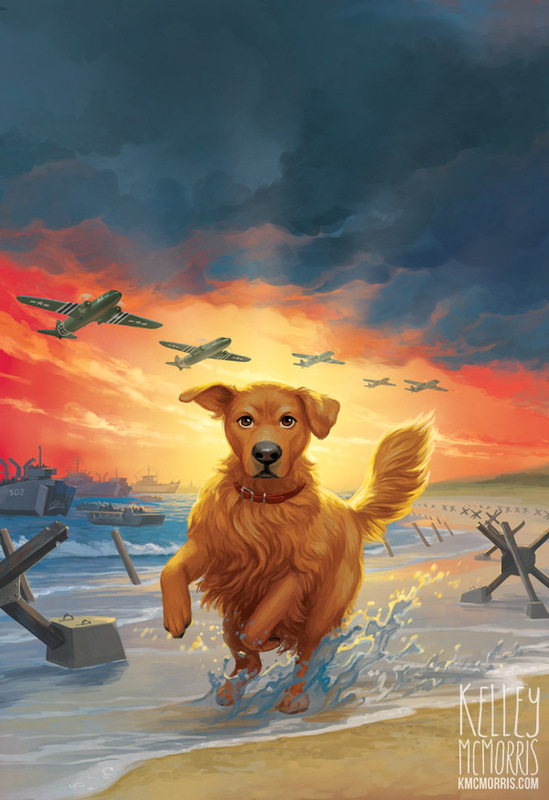 They wanted to see the Allied fleet landing on the beach and some planes in the sky overhead. But it also had to look fun and exciting. This cover also had to have a color scheme different from the other covers in the series so far. With each book, this gets more and more challenging! I started sketching out some possibilities, trying to find ways to fit in a fleet of ships and planes without distracting too much from Ranger himself, and not competing with the title text. Here are the three sketches I sent to Scholastic. I needed to depict drama and an epic scale without relying on guns, gore, or explosions. So instead I relied on some big storm clouds and dramatic rays of light in order to make the scene look exciting. Having Ranger in an action pose, splashing through the water, also helps bring some movement into the scene. 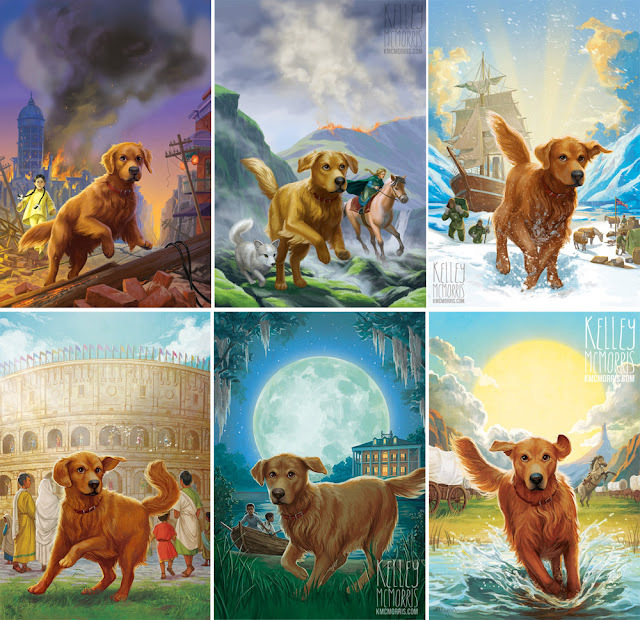 The art director, Maeve Norton, told me that the team liked the background of #1 with Ranger's pose from #2. They also asked me to add in some of the obstructions that the Germans had scattered along the beach. Here is the revised sketch. Next it was time to add some color. This was another tricky balance of historical accuracy versus artistic license. 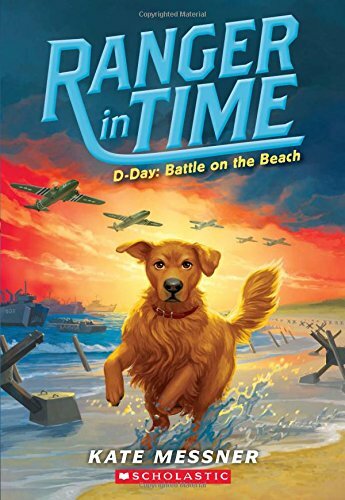 The Allies landed on the beach on D-Day at 6:30 AM during a rainstorm. 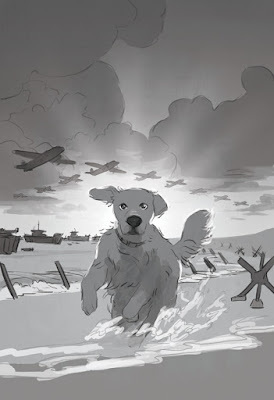 So naturally, the environment would be grey and dark, but that doesn't work for a children's book cover. We need something that's going to pop off store bookshelves! 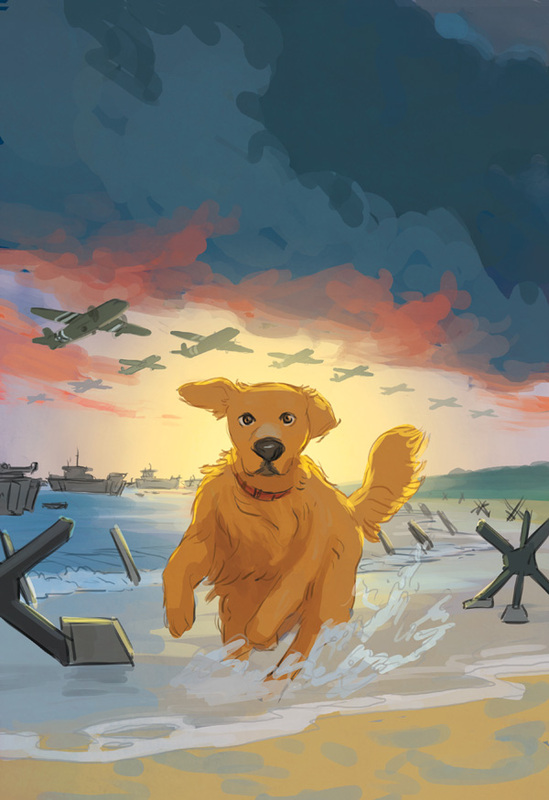 So the art director and I decided to split the difference by depicting storm clouds and a bright sunrise. This was my first attempt at the color rough. I was afraid to go too bright with the dawn colors because I thought it would detract from Ranger's orange color. (See my last attempt at an orange sky behind Ranger.) But the art director told me these colors were too soft and pastel. She told me to push the saturation more. She was right, this was much more exciting and bold. I got the go-ahead for the final. I love how it looks with the title text! The author, Kate Messner, posted this photo of her advance copies. 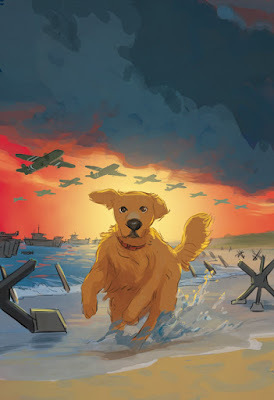 Ranger in Time #7: Battle on the Beach comes out on January 30, and includes 15 interior illustrations by yours truly! In my next blog post I'll be talking a little bit about the process of drawing the interior illustrations - with a special guest star!